I'm happy to be here today with you in this Synagogue. I thank Dr. Di Segni, Mrs Durighello and Mr Gattegna for their kind words. And I thank you all for your warm welcome, thank you! Tada Toda Rabba, thank you! With this visit I follow in the footsteps of my predecessors. 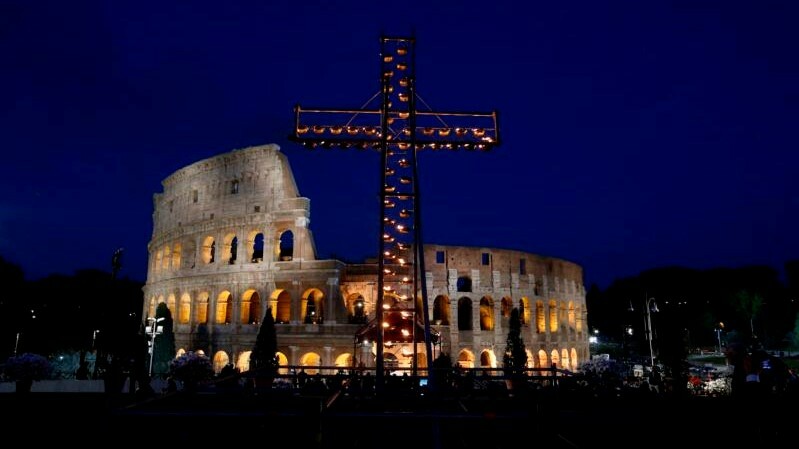 Pope John Paul II came here thirty years ago, on 13 April 1986; and Pope Benedict XVI was amongt you six years ago. On that occasion John Paul II coined the beautiful description "elder brothers", and in fact you are our brothers and sisters in the faith. We all belong to one family, the family of God, who accompanies and protects us, His people. Together, as Jews and as Catholics, we are called to take on our responsibilities towards this city, giving first of all a spiritual contribution, and favouring the resolution of various current problems. It is my hope that closeness, mutual understanding and respect between our two communities continue to grow. Thus, it is significant that I have come among you today, on January 17, the day when the Italian Episcopal Conference celebrates the "Day of dialogue between Catholics and Jews." We have just commemorated the 50th anniversary of the Second Vatican Council’s Declaration “Nostra Aetate” which made possible the systematic dialogue between the Catholic Church and Judaism. On 28 October last, in St. Peter's Square, I was able to greet a large number of Jewish representatives to whom I said “Deserving of special gratitude to God is the veritable transformation of Christian-Jewish relations in these 50 years. Indifference and opposition have changed into cooperation and benevolence. From enemies and strangers we have become friends and brothers. 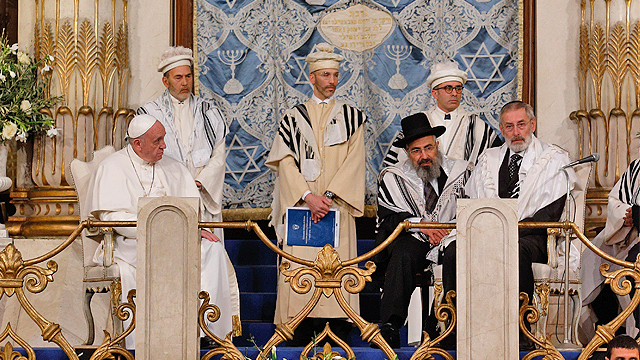 The Council, with the Declaration Nostra Aetate, has indicated the way: “yes” to rediscovering Christianity’s Jewish roots; “no” to every form of anti-Semitism and blame for every wrong, discrimination and persecution deriving from it.” Nostra Aetate explicitly defined theologically for the first time the Catholic Church's relations with Judaism. Of course it did not solve all the theological issues that affect us, but we it provided an important stimulus for further necessary reflections. In this regard, on 10 December 2015, the Commission for Religious Relations with the Jews published a new document that addresses theological issues that have emerged in recent decades since the promulgation of “Nostra Aetate”. In fact, the theological dimension of Jewish-Catholic dialogue deserves to be more thorough, and I wish to encourage all those involved in this dialogue to continue in this direction, with discernment and perseverance. From a theological point of view, it is clear there is an inseparable bond between Christians and Jews. Christians, to be able to understand themselves, cannot not refer to their Jewish roots, and the Church, while professing salvation through faith in Christ, recognizes the irrevocability of the Covenant and God’s constant and faithful love for Israel. Along with theological issues, we must not lose sight of the big challenges facing the world today. 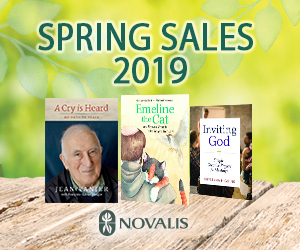 That of an integral ecology is now a priority, and us Christians and Jews can and must offer humanity the message of the Bible regarding the care of creation. Conflicts, wars, violence and injustices open deep wounds in humanity and call us to strengthen a commitment for peace and justice. Violence by man against man is in contradiction with any religion worthy of that name, and in particular with the three great monotheistic religions. Life is sacred, a gift of God. The fifth commandment of the Decalogue says: "Thou shalt not kill" (Exodus 20:13). God is the God of life, and always wants to promote and defend it; and we, created in his image and likeness, are called upon to do the same. Every human being, as a creature of God, is our brother, regardless of his or her origin or religious affiliation. Each person must be viewed with favour, just as God does, who offers his merciful hand to all, regardless of their faith and of their belonging, and who cares for those who most need him: the poor, the sick, the marginalized , the helpless. Where life is in danger, we are called even more to protect it. Neither violence nor death will have the last word before God, the God of love and life. We must pray with insistence to help us put into practice the logic of peace, of reconciliation, of forgiveness, of life, in Europe, in the Holy Land, in the Middle East, in Africa and elsewhere in the world. Dear brothers, we really have to be thankful for all that has been realized in the last fifty years, because between us mutual understanding, mutual trust and friendship have grown and deepened. Let us pray together to the Lord, to lead the way to a better future. God has plans of salvation for us, as the prophet Jeremiah says: "I know well the plans I have in mind for you—oracle of the Lord - plans for your welfare and not for woe, so as to give you a future of hope" (Jer 29 , 11). “The LORD bless you and keep you! The LORD let his face shine upon you, and be gracious to you! The LORD look upon you kindly and give you peace! (cf. 6.24 to 26 Nm). Shalom Alechem! I would like to welcome the religious, civilian and military authorities present here, the representatives of the state of Israeli and all of you. 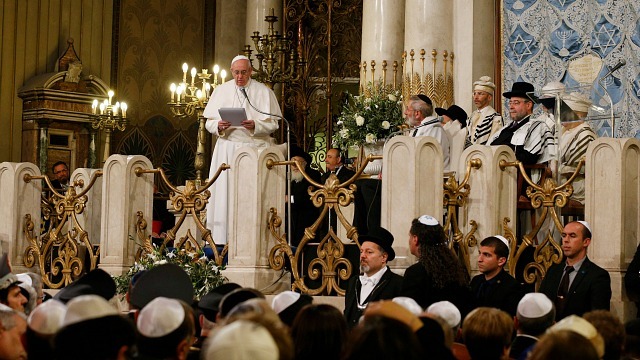 I feel moved to welcome Pope Francis on behalf of the whole Jewish community of Rome, the third Pope to cross the threshold of our Great Synagogue, whose short distance from St. Peter's has seemd almost impossible to travel for centuries. Today's meeting shows that the dialogue between great religions is possible. It is a pledge to be open to others and to promote peace and freedom for each human being. This shared commitment became a reality for the first time on April 13, 1986 with the Pope's historical visit to this Synagogue. We are here today thanks to two great champions of our time and especially to their courage: John Paul II and Elio Toaff zl. May their memory be a blessing for all of us. This historical event occurred again on January 17, 2010, thus giving a continuity to the friendly relationships between the two banks of the Tiber. This is the reason why I want to extend my warmest greetings to Pope Emeritus Benedict XVI. Today we are again writing history. It would have been difficult to imagine having this kind of meeting more than fifty years ago. Vatican Council II, launched by John XXIII, conceived Nostra Aetate, thus paving the way to a new path based on dialogue. Fifty years later, this path is still open also thanks to the Vatican Commission for Religious Relations with the Jews. As we know, Rome has a universal role. The Jews have been here for over 22 centuries. Our Community has written an extraordinary story of identity survival notwithstanding discriminations and persecutions. It is a lively, active and complex community. You, Pope Francis, have always been a friend of the Jewish world. You have taken with you from Argentina a sound relationship with the Jewish people, which you have strengthened since the beginning of your mandate. I want to recall two moments in which I felt particularly touched by your words. The first was during the visit of a delegation from this Community to the Vatican on October 11 2013, to which I had the honor to participate. You addressed our chief Rabbi stating “a Christian cannot be anti-Semitic. Let anti- Semitism be banned from the heart and the life of each man and woman”. The second was during themeeting You had a few weeks ago with the President of the World Jewish Congress, when you said that “attacking the Jews is anti-Semitism, but also a deliberate attack against Israel is anti-Semitism”. I want to reiterate this concept because this Community, like all the Jewish communities around the world, have an identity relationship with Israel. We are Italian and we are very proud of being Italian but, at the same time, we are part of the People of Israel. It is through Your words that I repeat with determination that anti-Zionism is the most modern form of anti-Semitism. Your trip to Israel and to its capital Jerusalem was a very important event for us. On that occasion too, You used words of profound respect for the Jewish State, hoping that it will be able to live in peace and security. In order to make this dream come true, we have to remember that peace cannot be conquered through stabbing and terror. It cannot be achieved through bloodshed in the streets of Jerusalem, Tel Aviv, Ytamar, Beth Shemesh and Sderot. It cannot be obtained by digging tunnels nor by launching missiles. Can we work on the peace process by counting the number of victims of terrorism? No, we can't. We must all call for a stop to terrorism. Not only the terrorism in Madrid, London, Brussels and Paris, but also the daily terrorist attacks in Israel. Terrorism is never justified. The hatred that comes from racism and bias or worse which uses God's name or words to kill deserves our contempt and our firm condemnation. Faith does not generate hatred. Faith does not shed blood, faith calls for dialogue. Coexistence should be based on openness towards the others, on peace and freedom, where it is possible to learn the respect for each other's identity. As we do today here in Rome and in any other place. Together with the Roman Jews, there are here many representatives of Jewish people from Italy and from the rest of the world, Italian Rabbis, Israeli and European rabbinic delegations and representatives from the Israeli government and state. And also many people who actively work to strengthen the friendly relations between the two faiths. In fact, this event is not restricted to the Jewish community that is geographically closest to Catholicism. It reaches out to the rest of the world with a benevolent message. 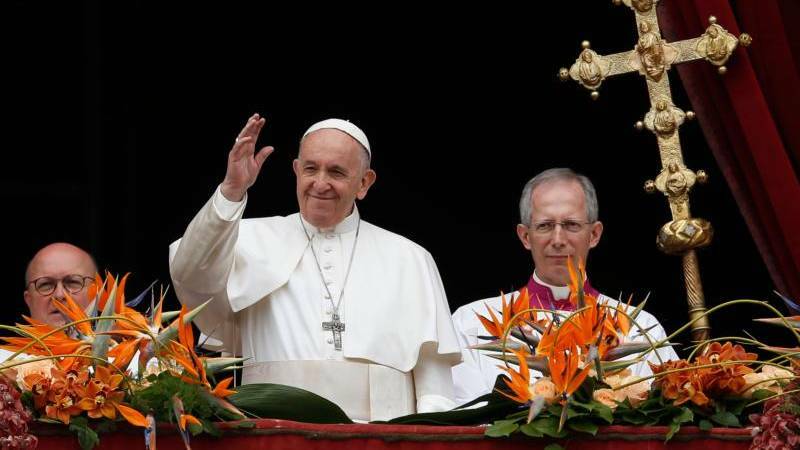 Pope Francis' visit takes place at the beginning of a special year for Christians, that he announced. The Bible founded the Jubilee that the Jewish people were not able to celebrate in line with the prescribed rules because of particular historical and political conditions; but the original idea of the Torah is still valid, it is a model to reshape society on the basis of dignity, equality and freedom. In any case, the Jewish people keep counting the sabbatical years; when multiplied by seven they represent the foundation of the Jubilee; during the sabbatical year - the last one has just finished - the land of Israel must rest and debts must be redeemed. We will soon celebrate the New Year of the Trees, connected to the agricultural cycle of the land of Israel. Many signs of the essential and religious relationship that we have with our promised land. Understanding this link should not be difficult for those who respect to the Bible, but it is still difficult. In these days in which the Christians are celebrating this special year devoted to mercy with its ancient references and new meanings, we have realized that, at the beginning of the door opening ceremony, an ancient liturgical formula was recited "open the doors of justice". A Jew knows that these words are familiar; it is a quotation from Psalms (118:19) pitchù li sha’arè tzèdeq, that we recite in our festive liturgy. It is an interesting link. 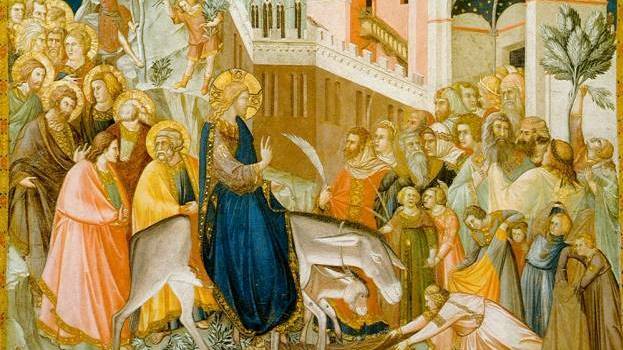 The event of Christianity devoted to mercy maintains a relationship with its biblical origins; it uses the verses from the Psalms, focusing in particular on the theme of justice which cannot be separated from mercy. It shows that these separate and very different routes of the two religions do share a common heritage considered to be sacred by both of them. This separation is rooted in ancient history. From many perspectives, this can be considered a tragedy, an enigma or a blessing. Of course this division has promoted the growth of great autonomous spiritual worlds, but it has also produced hostility, persecutions and suffering. We are all waiting for the time, we don't know how far away, in which these divisions will disappear. Each one of us has a different view of how this may happen. However, in the meantime, we must find a way to relate to one another, remaining faithful to our tradition. In peace and with respect. In the light of all of the above, I believe that there are two main signs to be highlighted today. The first is the sign of continuity. The third Pope who visits our Synagogue proves that the gesture made by the first Pope is still valid and meaningful, that is a break from the past characterized by contempt for Judaism;John Paul II's intuition was to translate the Council's difficult doctrinal interpretations in concrete gestures and essential and easily comprehensible messages. This was the aim of his visit to the Synagogue; this, in turn, paved the way to the recognition of the state of Israel. 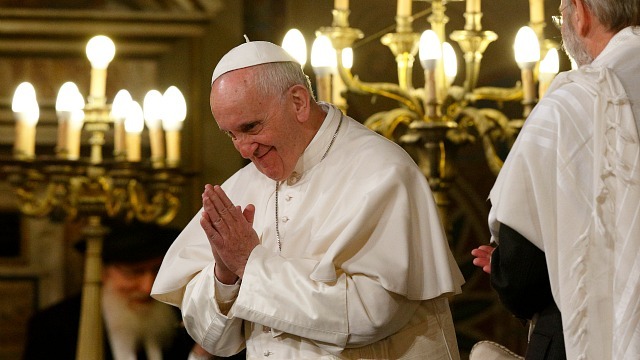 His successor, Pope Benedict, adopted the same approach; now Francis has established a habit. 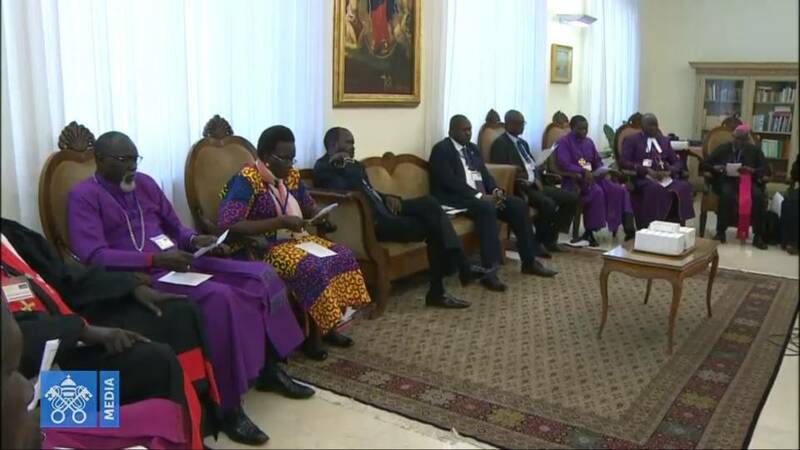 We interpret all this as a sign that the Catholic church does not want to ste back from the path of reconciliation. 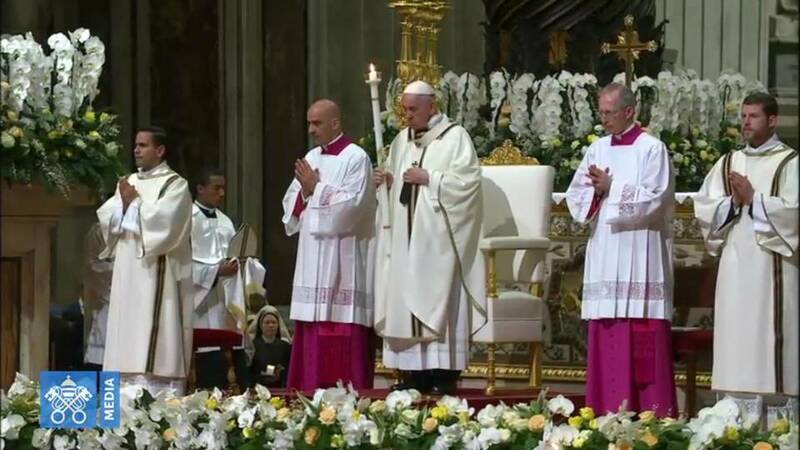 Pope Francis' personal commitment confirms this intention, as indicated by the great attention he has always attached to Judaism, first in his quality as Archbishop in Buenos Aires and now as Pope in Rome. Now he is here with us. We have talked about doors opening. To conclude I would like to share with you a quotation, the words of the invocation we recite everyday at the end of the ‘amidà prayer, according to the Italian rite: "let the doors of the Torah, of wisdom, intelligence and knowledge, of nourishment and subsistence, of life, of grace, of love and of mercy and gratitude be open in front of You". "May these words of my mouth and this meditation of my heart be pleasing in your sight, LORD, my Rock and my Redeemer".